After finding out the PlatformIO for IoT development I started to read some of the Platformio documentation and also what other users have written about it. What Platformio CI enables is that for our IOT projects we can have automatic builds after code commits on the code repository (for example, GitHub). When the automatically build is triggered, PlatformIO is able to pull all dependencies and frameworks to build our project on the automated build system. After the automatically build is triggered and the build is successful we can then deliver the output. One of the most interesting examples of this workflow is the following post http://blog.squix.org/2016/06/esp8266-continuous-delivery-pipeline-push-to-production.html that shows the process of developing, committing code to the repository, triggering automatic builds and, at major releases, deploy firmware updates over the air (OTA) to the ESP8266. All of this using Platformio and 100% cloud infrastructure for IOT deployment. Platformio supports several CI systems, and one of them is Travis.CI that integrates out of the box with GitHub. To enable Travis.CI on your GitHub projects/repository, just sign in on GitHub, and on (another browser tab) goto the TravisCI site and press the Sign in with GitHub button, accept the authorization requests, and select the repositories to enable for CI by going to your user profile. After enabling the repositories, every commit will trigger an automatic build on the Travis CI platform. As a build status indicator we can add a IMG tag to the README.md file so we can have the build status without going to the Travis site, for example: https://travis-ci.org/fcgdam/RFGW_SensorNodes.svg?branch=master. Travis.CI will start the build process according to instructions defined on the hidden repository file .travis.yml that is unique and specific for each repository. This Travis Documentation link explains in detail the logic and options behind the travis.yml file and build process. Fortunately PlatformIO when initializing a project creates a sample travis.yml file. The tags language:, sudo: and cache: are not changed in this case. The install: and script: tags are customized so that our project can be built. This, before building, will install first platformio, and then it will install the ArduinoJson (Id 64) library. We can add as much commands as we want prefixed by the dash character. Also this is one way of doing it, but this means that we need to change .travis.yml file every time we add/remove libraries. And in this case all the dependencies are associated within the project file. But in this case the build commands are different. I’m always using relative paths related to the project root in the above example. Further information can be found on the Platformio Travis integration guide and on the Travis.CI site. Since every commit to our repository triggers the Travis build process, we need now to distinguish between working commits and release commits so that on this last type, the build output is made available to be deployed to end devices/platforms for OTA updates (or not). This can be easily achieved by using git tags and conditional deploy process that only works when a git tag is defined. With this scheme the normal cycle of git add, commit and push will create a working commit that triggers as usual the CI build process but not the deployment phase of copying the build output (binaries, firmware) to the GitHub releases tab. Creating a tag and a release can be done either by command line or by using the Github web interface, being this the easiest way of doing it. – Generate an OAuth personal GitHub token so that Travis can copy the output to the Releases GitHub tab. – Encrypt the OAuth token with the travis command line tool. – Change the .travis.yml file so that it deploys the build output to the releases tab only at tagged commits. 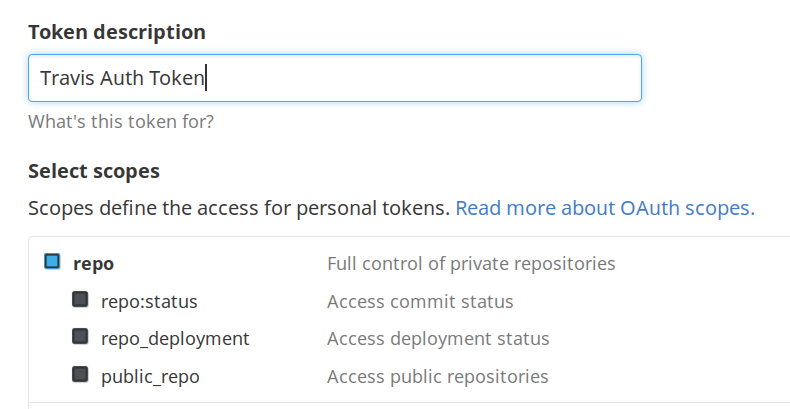 The GitHub token is generated by going to your Github Profile, selecting settings and then Personal Access tokens. Press Generate new token, enter your password and add permissions to access your repositories. Make sure that at the end you copy the OAuth token, otherwise you must generate another one from the beginning. The Github token must be kept secret at all times, and since we need to have it on the travis.yml file which can be read by everyone, we must make sure that we encrypt it in such a way that only Travis.CI can use it. The GH_TOKEN is the name that must hold the OAuth token so that Travis can use it securely. We can now add the final configuration to the Travis.CI configuration file, so that at tag releases, the build output is automatically added. The provider: tag defines that we want to deploy to GitHub Releases, and the api_key: tag contains the secure Oauth token to access GitHub. The file: tag define which files we want to deploy, and in this case we use the $TRAVIS_BUILD_DIR environment variable to locate our build directory root. The skip_cleanup: will avoid cleaning all build outputs. The on: tag is the most important because it conditionally defines that the deploy process only happens at tagged release. [pcortex@pcortex:RFGW_SensorNodes|master]$ git tag -a v0.3 -m "Version 0.3"
We have now a tagged release with source code and binaries automatically created and packaged. At this point we have the deliverables for a release, and we should now distributed/deploy it. This is by itself another process that can be done through Cloud services or locally, it really depends of the end architecture. The most important issue here is related to security: making sure that the correct build is delivered, was not changed in any way and reaches the intended devices.